Inside East Africa’s largest national park, Ruaha in Tanzania, stands a group of conservationists with six carcasses of dead lions before them. Beside the lions is another carcass of a cow, which they seem to have been eating before they met their death. 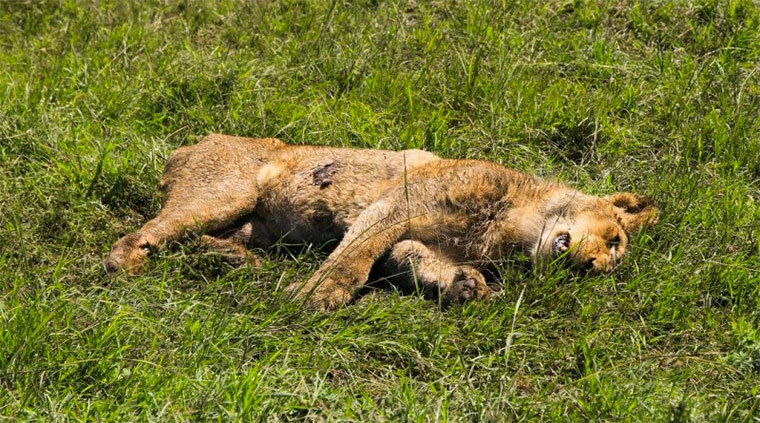 The Ruaha Carnivore Project (RCP), an organization working with communities living near the park to promote co-existence, said in a statement last week that after alerts from the park, they found a “devastating scene” where the lions, four females and two males, had been killed apparently by poisoning. “This event had additional tragic consequences, with dozens of critically endangered vultures found dead or badly affected. RCP worked closely with colleagues from Wildlife Conservation Society Tanzania Program, the [Tanzania National Parks Authority] authorities and other local agencies, and they eventually found 74 dead vultures as well as the six lions,” the statement said. RCP said preliminary investigations pointed to the possibility that someone poisoned the cow carcass after lions attacked his cattle. But this is not the first incident and this is not the only part of the region where the activity is ongoing. East Africa is known as the home of the big five game animals and you cannot miss to see at least one in any country you choose to visit; and now one of them, the lion, is under threat, because of attacks from the community especially through poisoning and from trophy hunters, and poachers. Conservationists say many communities that live near the parks are ranchers and livestock keepers whose animals are always attacked by the predators. These, like poachers, have become big threats to national parks and wildlife. “Alarmingly, poisoning is a common response to conflict, and this highlights how vital it is to do all we can to prevent carnivore attacks on stock, and reduce chances of retaliatory killings,” the statement reads in part. What should be done, according to the organization, is to put up predator-proofing enclosures and engaging communities, but it maintains that much more is still to be done in protecting grazing livestock, a particularly challenging venture. The organization, however, says such attacks have been reduced of recent. “It is also vital to secure the wildlife management areas and – probably most important of all – make sure that local people receive real benefits from wildlife, so they eventually see them as more of an asset alive than dead,” they said. Tanzania has the largest number of lions remaining in Africa to a tune of over 16,000 but they are being threatened by trophy hunting, poaching and retaliation killings by communities near parks. Two years ago, researchers from the New York-based Wildlife Conservation Society and the University of St Andrews in Scotland analyzed the density and population distribution of the African lion in three of Uganda’s national parks. In two of the parks surveyed, Queen Elizabeth national park and Murchison Falls national park, lion populations have decreased by 30 per cent and 60 per cent respectively over the past 10 years, which the study attributes to poisoning and physical killing of the lions by nearby communities. Only in Kidepo Valley national park, in the northeastern part of the country was the number of lions found to be increasing, climbing from 58 to 132 in the last decade. The dwindling number of lions in the region could be a threat to the region’s tourism sector if massive sensitization and protective measures are not adopted. The Uganda Wildlife Authority (UWA) gives a percentage of its revenue to the communities where the national parks are situated, as a way of improving the sense of direct stakeholding in the parks. Already districts are earning hundreds of millions of shilling from UWA under this partnership. • The East African lion (Panthera leo melanochaita) is a lion population indigenous to East Africa. • Lions occur in Ethiopia, Kenya, Somalia, South Sudan, Tanzania and Uganda. • The reputed king of the jungle is extinct in Djibouti, Egypt and Eritrea. • African lions are the most social of the big cats and live together in prides. A pride consists of about 15 lions. • Females do most of the hunting. Despite this, the males eat first. • The lion is listed as vulnerable on the IUCN red list of threatened species. • The lion was once found throughout Africa, Asia and Europe but now exists only in Africa, with one exception. The last remaining Asiatic lions are found in Sasan-Gir national park in India, which was primarily created to protect the species. • A lion’s roar can be heard from as far as five miles away. • Even though the lion is referred to as “king of the jungle”, it actually only lives in grasslands and plains. The expression may have come from an incorrect association between Africa and jungles. • The darker the mane, the older the lion. • A lion may sleep up to 20 hours a day. • The female may mate approximately every 15 minutes when she is in heat for three days and nights without sleeping, and sometimes with five different males due to physical exhaustion of males when only one or two are involved.